Winding down for Christmas is met with mixed feelings by many business owners. On the one hand, it is a chance to step back and enjoy a slightly slower pace after a busy year, but it is also considered lost time by many. So many companies start their wind down earlier than necessary, spending the final weeks of the year tidying up files and tying up loose ends, at half speed. Few of them realise that the wind-down period leading up to Christmas is the ideal time to set up for next year, be it with a facelift for the office branding and décor or seeking out new opportunities to hit the ground running with. Many of us use the New Year as an opportunity to try self-improvement or switch things up a little with our look and style. This makeover mentality can be applied to the office too. You don’t have to completely scrub your brand and persona; just make a few tweaks to give it a facelift. A fresh new look with bespoke office branding in the main entrance or foyer of your building will let you impress guests old and new; extending this into meeting rooms will offer a good talking point too. Redecorating the main office with custom graphic transfers will also create a much-needed buzz for employees returning from their Christmas break, creating the impression of a new environment, without requiring too much work. 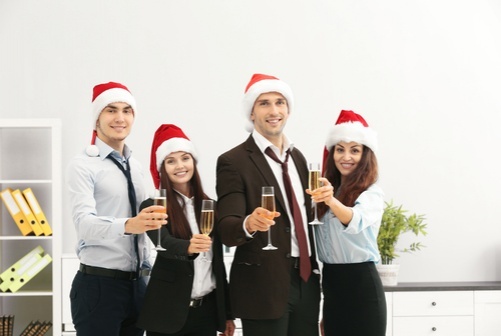 Networking is vital to business all year round, but if you’ve ever struggled to open a conversation with a would-be contact or you don’t like the idea of cold leads, you will be grateful for the festive season. The end of a year, the cheerful Christmas spirit, and the increased communication at this time of year gives you all the opening you need. Instead of calling or emailing a contact out of the blue and hoping your random approach isn’t too awkward or pushy, you can simply send Season’s Greetings and best wishes for their 2017. Once this channel of communication has be established and you get a response, you can move naturally into a more detailed conversation. Remember, networking isn’t about getting wins straight off the bat. It is about building relationships and letting your clients (or potential clients) know you think of them as more than just a number. So, embrace the goodwill of this time of year, and send good thoughts in greetings cards or emails. Be sure to get involved with the various parties, coffee mornings and business-social events the holidays bring, too - face to face contact is always the most valuable. Last but not least, use December as a time to get all those ducks in a row. Research upcoming events and try to plan at least 1-2 quarters in advance. Make time for social and team building events, training days, and exhibitions to attend. Make a list and start planning or sourcing any collateral you might need for these events, such as exhibition equipment and event venues. The more you have pencilled in by the time 2017 arrives, the less you’ll need to worry about post-break. Why wait until January to kick off 2017’s plans? The last few weeks in December are just as, if not more valuable than those first few of the New Year. Come 1st January, your staff and industry will be shaking off Christmas cobwebs and festive food comas. It will take a while to get back in the swing, so get a head start before the Christmas break – you’ll be glad you did! Be sure to let us know if we can offer any help or guidance too, as we will be working full speed ahead throughout the festive season to ensure our clients have everything they need come 2017.